Epoxy Pad Printing is the most economical way to imprint smooth plastic handled knives or plastic display box tops. We use long-lasting Duratech epoxy combined with specially formulated hardeners for increased durability. Epoxy is a petroleum based product similar to the platic knife handles and presentation boxes. Since adhesion between like molecular structured materials is exellent, we have enjoyed great success with our process. The most popular colors within the epoxy pad printing color palette are white and gray. 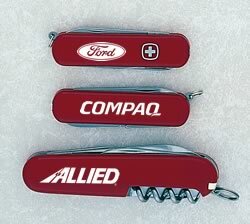 These colors show up well on a red Swiss Army knife. 2 colors are possible. Two epoxy pad printing masters are required, one for each color. The number of impressionable imprints also increases. Multi-color pad print must be approved by factory prior to order submission. An epoxy pad printing master must be prepared for each logo. This delicate fine line screen can only be of one size. If a larger or smaller imprint of the same logo is required, a second master must be purchased. Information cannot be edited on the master, a new and separate master is required for copy changes. Therefore it is cost prohibitive for individual names to be pad printed. Personalization is best achieved via rotary engraving with colorfill. As always we will assist with artwork cleanup and typesetting. In most instances this is performed at a minimal fee or at no charge. We want you to have the very best looking project possible. We do not print on ballistic cloth or nylon sheaths. The surface is too textured, and epoxy tends to “pond” in low areas. The same effect is found on woodgrain handles and all textured plastic and rubber knife handles. Epoxy pad printing cannot be used to imprint metal knife handles or knife ends. We recommend Jewelers’ diamond engraving which will not wear off when carried in one’s pocket.